Photo: T.H.Everitt; cropped image,from the Estate of Gladys Cheetham, courtesy of The Harrison Weir Collection. A very promising female as attested to by her beautiful photograph. We would not know anything about 'Oaklands Sally' if her short life had not been recorded by her owner in her Cattery records, as to date, no trace of her has yet been found in any Register. From her owner's estate, we have the precious photographs by Crystal Palace Photographer, T.H.Everitt. We know only of her wins at the Halifax Show of 23rd November 19111, before her untimely demise on December 30th that same year1, from the effects of the dreaded 'show fever'. However, her wide head and pleasant countenance appealed to such a degree, that we felt duty bound to choose her to represent the "clubs" in the banner on the homepage for that feature of this site, as well as on the navigation button for "clubs" shown at left. Oaklands Sally was born on 19th April, 1911, bred by Mrs H.M.Hall. 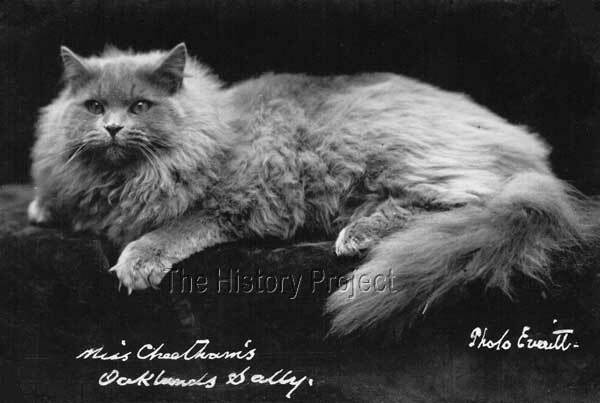 Her sire was the Blue Persian male, 'The Catch Of The Season'(c1906), himself a son of Ch.Kew Blue San Toy II (doubling on Eng.Ch.Patrick Blue).Her dam was the Blue Persian female, 'Thorntree Beauty'. (of which there is currently no concurring record). And given her obvious qualities, she was purchased by Miss Gladys Cheetham for the very reasonable sum of £10.0.0(Ten Pounds)1. 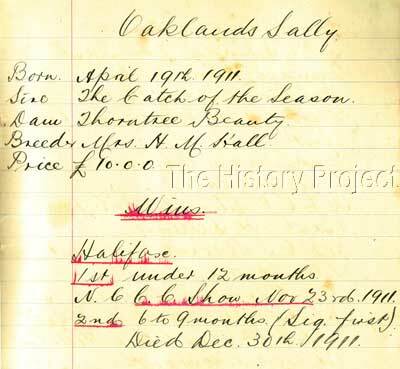 Record of the parentage, purchase and wins of Oaklands Sally. Image from the Gunnersbury Lodge, Mill Hill Park book, (Oaklands Cattery) courtesy of The Harrison Weir Collection.. Passing at the tender age of 8 months, 'Sally' was unfortunately too young to have been bred. It is a testament to her owner's great care, in feeding and grooming, when analysing the lovely photo of 'Sally' that she could look so mature and in such great condition in the photo, in which she cannot in all probability have been more than seven months old. It highlights the great risks taken when showing young cats and kittens at a time when there were no vaccinations or antibiotics available to counter the threat of disease and distemper. We can only imagine the heartbreak of such tragic losses. 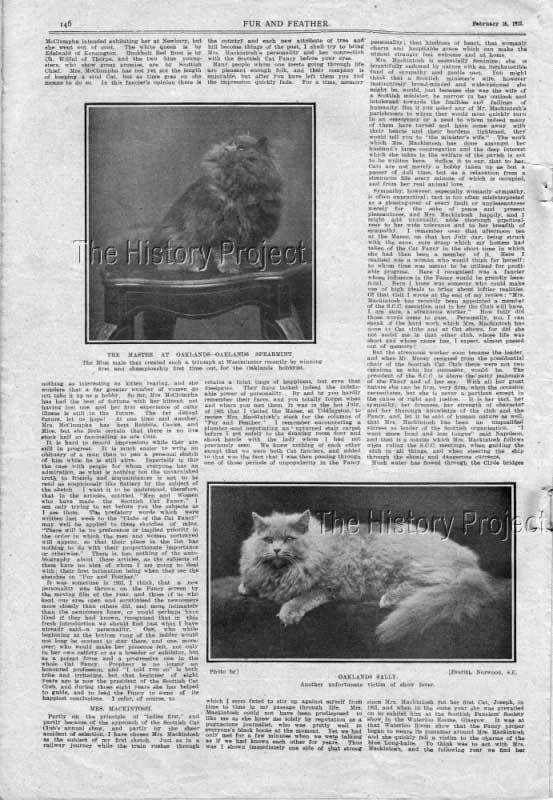 This image appeared in the February 16th, 1912 edition, of 'Fur and Feather'. From Fur and Feather, February 16, 1912: "OAKLANDS SALLY - Another unfortunate victim of show fever." 1. Breeders Records, Gunnersbury Lodge, Mill Hill Park Book, from the estate of Gladys Cheetham, courtesy of The Harrison Weir Collection. 2. All photos as per Sources and Credits given.